Kimberley - Kane Williamson’s 145 not out helped New Zealand to 279 for eight in the second one-day international against South Africa at the Diamond Oval on Tuesday. Coming to the crease when New Zealand were one wicket down without a run on the board, Williamson went on to make the highest individual score by a Kiwi against South Africa. The previous highest was Stephen Fleming’s 134 not-out in Johannesburg in 2002/03. It took 21 balls for the Black Caps to get off the mark after South Africa won the toss and put them in to bat in the scorching afternoon heat. 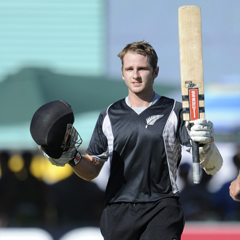 The visitors made another disastrous start after Martin Guptill got his second duck in a row. He top-edged a Rory Kleinveldt delivery in the third over, giving stand-in captain Faf du Plessis a comfortable catch at point. After Morne Morkel took his 100th ODI wicket, trapping BJ Watling in front for 12, Kane Williamson and Grant Elliot came together at 32 for two. The pair added 127 runs off 130-balls before Kleinveldt induced Elliott to edge one to ‘keeper Quinton de Kock, for 48. Williamson went on to make his third ODI century off exactly 100 balls, including 14 boundaries - passing his previous best of 108 against Bangladesh. Lonwabo Tsotsobe chipped in with two wickets in one over. The slower ball fooled ODI debutant Colin Munro, who skied one to Colin Ingram, who ran in from the deep to take an excellent catch. Two balls later, the reverse swing saw James Franklin bowled through the gate. Trailing 1-0 in the series, South Africa need to make 280 to level matters.